Usual distances for the kids, I ran 5 with Joseph, 5 alone, then later in the evening 2 with Zachary including his warm-up, mile time trial - 6:58.4 (1:43, 1:46, 1:45, 1:41), and cool-down, and later 0.75 with Matthew. Zachary's mile time trial (Orem High). Did something different today. Split the long run into two parts - morning and evening doing exact same workout both times. The workout was 10.5+ miles with 3 fast in the middle. In the morning I ran 16:30 (5:27,5:33,5:30). In the evening I did 16:58 (5:28, 5:49, 5:41). This was an interesting experiment. Part of the challenge of the evening workout was that it was that it was warmer. Part that it was dark. But I think most of it came from glycogen depletion. So I suppose we can say that 10 hours is not enough to fully rebuild glycogen stores after a 10 mile run with a 3 mile tempo in the middle - at least for me. Warm-up - most of it with Jenny. Back to the house with Jenny. Second session. Joseph rode along with me on a bike. Total of 11. Kids ran mostly on their own because I had a company meeting to get to. Later in the day I did another mile with a fast uphill quarter at the end. I wanted to get another data point. Lately I have been struggling with upper range speed. Anything faster than 5:35 down the canyon (which I consider to be a flat sea-level equivalent) has been putting me over the edge in an odd way. I am not really breathing that hard, legs are not sore, just cannot move for the life of me. Putting two and two together I figure the problem is in the adrenal glands. What do I do about it? If I run less and/or slower I lose the endurance. If I continue to work on the endurance, I hit a hard barrier and cannot really work on it anyway. So that leads me to the next option. Some dietary changes and some supplement. Now we are in the area of black magic. I do not eat any junk food, and already consume a good amount of fruit and vegetables with moderate amounts of meat. So it is not as simple as just stop eating things you very well know you should not be, and start eating what you should. We are in the area of fine tuning. Supplement-wise, there are a lot of supplements that promise miracles, and some of them do when applied in the right combination with the diet, training, and rest. In 2003 I stumbled on that combination which allowed me to recover from a slump of 2002 and improve from 2:33:20 (2001) to 2:27:46 on the same course (TOU) in spite of being 2 years older and now taking care of one more kid going from 2 to 3. But now I am in a different type of body that responds to different things, so I need to find something different. A short run with a fast uphill quarter at the end to help me understand what is going on. Last workout before the Top of Utah. Did 10 with a 3 mile tempo down the Canyon in the AM and paced Joseph (sort of) in the cross-country 3 K in the PM. Struggled in the 3 miler, but I was expecting it: 16:37(5:30,5:31,5:36). The 3 K (11:41) felt better than I was expecting. I though after the morning run I would have to run pretty close to all out just to keep up. But I was able to run with Joseph just fine - though it took me a good half mile to weave through the crowd of kids to catch up. Once I did I slowed down for him, and he was responding for a while. But then I accidentally dropped him somewhere around 2 K. When I realized that he lost contact, I decided to just keep going at the pace I was going to be a moving target for him in the kick. But he never closed the gap and finished in 12:03 21.8 seconds behind. Jacob got 12:25, Jenny 13:26, Julia 14:56. The course was slow and also possibly long. Then I paced Matthew in the second heat to 18:36 3K. Unfortunately the second heat got messed up due to too many people taking wrong turns, so they cancelled its results. The trouble is that Bicentenial Park is too small, but the city really does not have a better option right now due to the construction at Kiwani's. Cool-down - most of it with Joseph. Short warm-up before cross-country 3 K.
Paced Matthew in the 3 K cross-country. Tapering. 6 total for me. Jacob did 4, Joseph 5, William 3, Stephen 2, Matthew 1. Taper for me, Joseph, Jacob, William, and Julia. Usual distances for other kids. Part with Jacob, part alone. Same group with the exception of Matthew. Part with Jacob, part with Sarah, part alone. Top of Utah Marathon, 2:46:16, 9th overall, 2nd master, $250. This was a strange marathon. Coming in I knew something was off from my workouts over the last two weeks and the Layton Classic 10 K. But I hoped that some rest during the taper would take care of it. It did not. I started out with Nan and Matt Wolpert. The pace felt harder that what it should have, but I could keep it. I decided to hang in there for as long as I could figuring I really did not have much to lose. I ran in front for the first 3 miles, then Nan took over and I never felt like I had the strength to step forward and help with the pace. It would have helped as we had some headwind gusts, but Nan was strong and handled them just fine. I made it to the half in 1:18:04 and then all of a sudden just did not have any drive to go. I backed off thinking I'll maybe run 6:10-6:15 for 5 miles before I go into the end of the marathon survival. That ended up being wishful thinking. I ran 1 mile in 6:21, and then 6:25-6:30 pace, and then survival. The entire time somehow I felt the illusion of running well. Without a watch I would have told you that I was running 6:10-6:15. Positive thinking is good, but you need to back it up with physical strength which was lacking today. Nan and Matt ran very well. Nan got the course record in 2:38:52. Matt won the masters with the master's course record in 2:38:41. Nate Krah won with 2:27:01. The official times were messed up by 27 seconds (which should be added to get the correct time). I reported the problem and the timer acknowledged it, but last time I checked they were posted incorrectly. In the 5K Joseph ran 19:18 (2nd overall), Jacob 19:28 (3rd), William 22:08, Julia 22:51 (1st woman). Not sure why they were so slow - maybe the combination of getting up at 4:30 am, cold morning, and the lack of a good warm-up. Even though my result today was disappointing, it was a good data point. The problem was clearly not fuel, but rather adrenal fatigue. I know what it is like when it is fuel - you can recover your pace partially by drinking something with sugar. It also does not happen at 13 miles. And in an odd way it was good to feel it for a long time and clearly separated from the fuel struggle to know what it feels like in and of itself. 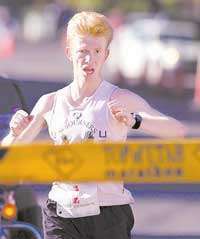 I re-read my race reports from the past and recalled how it felt to run in the good races as well as in the bad ones. I am now inclined to think that the difference between my better years and my worse years was mainly in the adrenal performance. Which is both encouraging and frustrating. Encouraging because if I did discover a reliable way to train the adrenal performance I could run very well - even now that I am 44. Frustrating because adrenal performance is not easily trainable. There is a predictable way to ruin it - sleep less, eat poorly, have a stressful life, train more. But going the other way - sleep more, eat well, avoid stress, train moderately - does not predictably develop it. It is necessary, but not sufficient. Nevertheless, I believe adrenal performance is still governed by some law that we can learn if we try hard enough. Over the course of the next few years I will do what I can to learn it. Day of rest. Went to church. We had a regional conference broadcast at the stake center. I felt OK but not super-great though I think better than I expected to feel. It is hard to tell what that time meant on that course given dubious accuracy and difficult terrain. I think this was with William, Jacob, and Stephen. I believe this was with Jenny. Today was an interesting day. I ran 9 total with an uphill quarter sprint at the end. The result surprised me. I ran 83 the week before the marathon, and tried two more times under different circumstances getting 81 and 80 (80 was not at the end of anything long). I thought was feeling a bit more energetic today, so I told Joseph I was expecting 79. Somehow I ran 75.1. Joseph did 76.9. Kids ran more or less their usual distances. I was finally able to convince Matthew to go back to the old 0.5 on the little boy course routine. During the fast quarter I felt that the speed gain came mostly from the increased stride length, though I did not count the turnover to verify that. With Matthew, Stephen, and Jacob. With the above crew minus Matthew plus William. Uphill pickup at the end - my time. 8 total, usual distances for the kids, easy pace, felt somewhat energetic. Part with William and Jacob, part with Joseph, part alone. Jacob suggested we should do a mile time trial today, so I took the little boys to the track. I was excited to test what that 75.1 uphill quarter at the end of 8 would show on the track. I was planning to pace Joseph (and Jacob if he could keep up) for the first three quarters, and then kick to see what I had in the last lap. So I took Joseph through the first 400 in 77 high which did not feel as easy as it should have been based on the uphill run on Wednesday, and then lost power. He had to step forward and help me with the pace. Our next two laps were 83 and 85. He kicked in the last lap running it in 82 and nearly dropped me. We finished side by side in 5:30.0 missing his record by 2 seconds. Jacob struggled, ran the first lap in 84, then got discouraged and finished the mile in 5:54. Matthew struggled as well in the 800, some of it was mental. He ran the first lap in 1:55, then he had 3:26 with 100 to go, but then just let his guard down and missed his not very strong record of 3:58.7 by a little over a second in the last 30 meters. He tried again, but only could run 4:16. William also struggled in the mile - opened with 87, then it all went down to pot and he finished in 6:15. Stephen did a bit better, but still missed his record in the 800 running 3:20.8. Splits - 47, 52, 53, 48. I went for more distance after this and noticed that I was very sluggish choosing about 8:00 pace. Yesterday the same level of effort was giving me 7:10. I tried the uphill sprint at the end to get another data point and ran 83.4. I felt the stride length was too short but just did not have the power. We did have a weather change - temperature dropped about 10F to 44F, there was a light drizzle, and 96% humidity. This should make things a bit harder, but not that hard. There was something else at play. What is odd is that it affected everybody. With the crew pacing Matthew. Joseph's time and mine as well. Crew pacing Matthew for try 2. Pacing William - alone again. Ran with Chad, then with the kids. Paced Sarah with Chad through 3 miles down the canyon in 23:40 (7:50, 7:56, 7:54). Then did a tempo run with Chad - 0.75 up, 1.5 down, 0.75 up. First two with Chad, then the last one hard. Expected Chad to run 95s uphill and 88s downhill. He ended up going faster - 4:34 (91 average) for the first 0.75, then 7:09 (86 average) for the next 1.25. Once I sped up I ran 82, then turned around, 93, 90, 88. Finished in 17:36. Chad got around 18:00. Felt stronger than expected. Finished 10 with Chad then ran 6 more with the kids. They ran their usual Saturday distances today. Decided to do the quarter test up the hill at the end. The results were fascinating - 76.3 compared to 83 yesterday. Joseph ran 76.7, Jacob 80.5. Now how in the world does it happen? Wednesday I run 75 four days after a marathon and 14 hours after running a hard 1 K at the end of 8 miles. Then I run 8 easy miles on Thursday, run 1 mile on the track in 5:30 struggling, then at then end of 8 run 83. Then on Saturday I do 16 total with a 3 mile tempo run in the middle, and I am able to run that same quarter in 76! Two more data points - two weeks ago after racing Layton Classic, a drive home, breakfast, and a short nap, I ran the quarter in 81 at the end of 4 more miles (racing Joseph). Then on Monday I ran the same quarter alone at the end of 10 in 83. We can allow for one factor - racing Joseph. That make a difference of maybe a second or two. But not 7 or 8! Something very interesting is going on. Fatigue from running appears to be rather irrelevant - I was able to run 76 at the end of the longest and hardest day with some hard running done the day before. I have been going to bed consistently before 10:30 pm this week which would explain the improvement from pre-marathon 83 to post-marathon 75. But why the regression to 83 on Friday? This does not look like something was just tired, this looks like the entire subsystem was completely shut off, but then the next day it turns back on. Need more data to understand this. Warm-up with Chad and Sarah. A little jog with Chad to get to the start of the tempo. Out-and-back tempo in the canyon. With Chad to the car. With Joseph and Jacob, first mile with William.